This is the shocking moment allegedly showing a group of pro-hunt supporters attacking a van full of animal rights activists after they spotted them pulling into a pub car park on their way home from disrupting a meet. A masked man was seen leaping onto the bonnet of the vehicle and thrusting his palm against the windscreen then ripping off a wiper after the hunt saboteurs were cornered outside a Cheshire pub. Another man was also caught on camera hitting the van with a pool cue before the driver managed to reverse clear and escape through the rear exit of the Wheatsheaf Inn in Onneley, Cheshire. Sheffield Hunt Saboteurs claim they were regrouping with other teams when they were targeted by ‘frustrated’ supporters of the North Staffordshire Hunt on Saturday afternoon – after their protest had forced them to pack up and leave early. Staffordshire Police said its officers were called to the scene but no arrests were made and enquiries are ‘ongoing’. Footage released by the hunt saboteurs shows several people standing in front of a van, blocking it from leaving. A man inside the van can be heard desperately calling police for help and tells the operator they are being boxed in by hunt supporters wielding pool cues. As they back up, a masked man suddenly jumps on the bonnet and thumps the windscreen with his palm but fails to break the glass. He tears off a windscreen wiper and throws it to the ground as the man in the cap hits out at the vehicle with his cue. More loud thuds are heard as the driver manages to quickly manoeuvre and accelerates away through the other exit. A second clip also shows the masked man sprinting after another sab van as it too makes a hasty getaway. In a statement, Sheffield Hunt Saboteurs said: ‘During a post-sab rendezvous at a local pub members of Sheffield, West Yorkshire, Liverpool and Manchester hunt sab teams were subject to an unprovoked attack by hunt thugs wielding pool cues, threatening sabs, damaging a vehicle and attempting to smash one group’s windscreen. 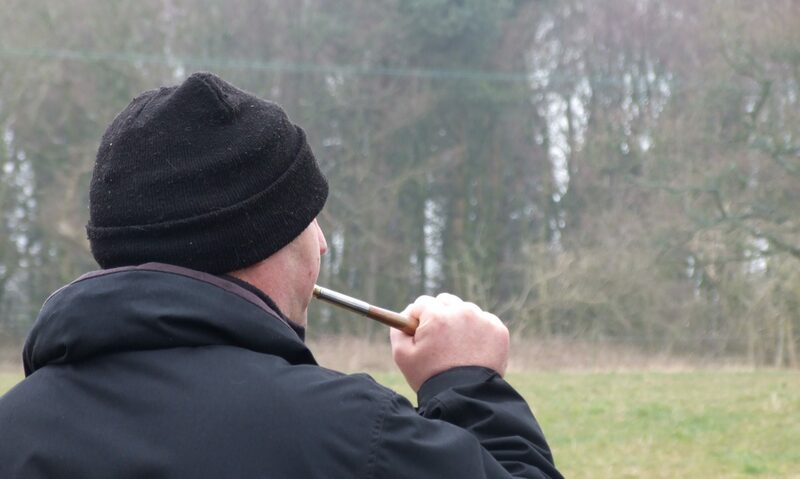 The hunt said in a statement: ‘The North Staffordshire Hunt had finished their legal hunting activities for the day and their members had left the area where any incident was alleged to have taken place on Saturday, January 5.